EUR is under pressure due to the poor economic data. The industrial orders in Germany for June gave some support to EUR this morning. 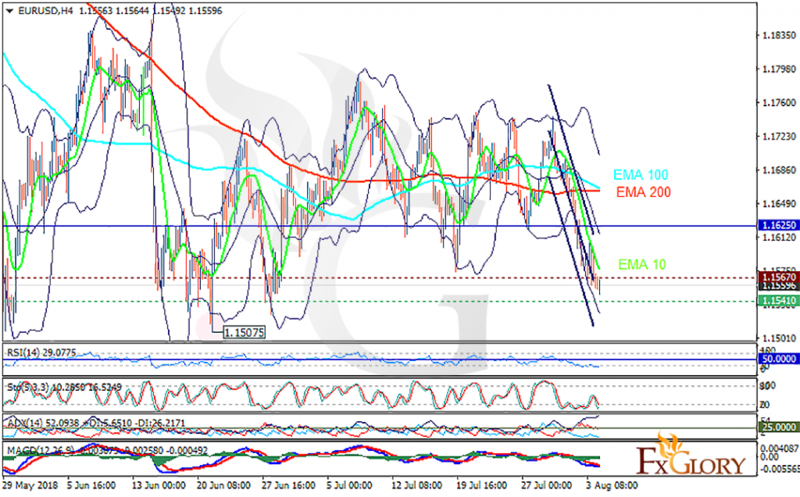 The support rests at 1.15410 with resistance at 1.16670 which both lines are below the weekly pivot point at 1.16250. The EMA of 10 is moving with bearish bias in the descendant channel and it is below the EMA of 100 and the EMA of 200. The RSI is moving in oversold area, the Stochastic is showing downward momentum and the MACD line is below the signal line in the negative territory. The ADX is showing strong sell signal. The price is falling down towards the lowest rate this year at 1.150. The support level breakthrough will smooth the way for further decline towards 1.15.